Feast your eyes on this 1981 Cadillac Fleetwood Limo, fresh from the days of big hair and sugar coated keyboard riffs. Except this limo has a little more attitude than your normal run of the mill transporter. This Cadillac is running a freshly rebuilt Chevrolet 454 Big Block motor and drag radials. Prepare to get your guests to their destinations quick. 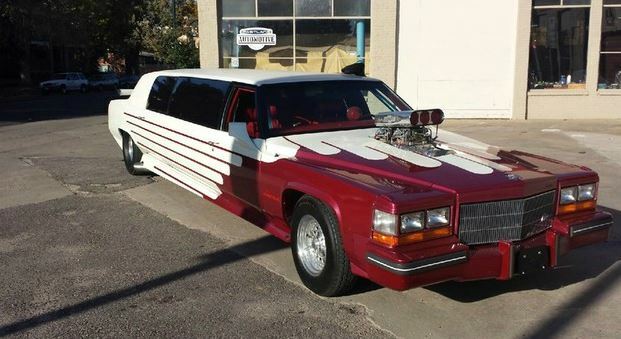 Call it a Fleetood Limo-V. The seller has a near endless amount of upgrades listed and says over $180,000 has gone into custom work for this stretch with attitude. Highlights include a 671 BDS blower, dual 4 BBL Chrome Holly carburetors, freshly rebuilt Turbo 400 automatic transmission, built 9in narrowed and chromed tubbed with four link racing rear end. Oh, and the front seats are from a Porsche Carrera. The body is extremely clean with only 24,000 miles reading on the odometer, and although the paint is a bit much, it matches the persona of the limo in screaming good fashion. Going back to that niche thing, there aren’t any bids currently but three people are watching the vehicle. So if your heart desires, you have a little over two weeks to find space in your garage for this. Its the Love Fist from GTA Vice City! That’s the car! Oh that takes me back! Oh, that takes me back! I’m disappointed in myself for not realizing the similarities. This is excellent. Great article. As I run a chauffeur company, it’s always good to see older cars coming back! This is something I will definitely take a look into as clients may enjoy.